January 23, 2017 – The inauguration is over. Celebrations and protests alike have completed. Many Americans are now heading home and taking stock of how their country and the world have changed over the last eight years under the stewardship of Barack Obama. And just as there are competing views of what has been accomplished, so too are there opposing perspectives on what to expect in the next four years under President Donald Trump. A new survey from the Angus Reid Institute finds Americans equal parts positive and negative about the economic legacy of the Obama administration, but finding little else to celebrate in terms of progress when it comes to America’s standing in the world, and the safety they feel at home when looking at global threats. And while views on these same questions looking at the next four years follow a similarly negative line of anticipation, Americans say by a margin of nine percent (43% to 34%) that they expect the economy of the country to improve in the hands of President Trump rather than worsen. Indeed, their primary source of concern when looking at the new administration is the status of peace around the world. Twice as many Americans expect a worsening of world peace than an improvement. Equal numbers of Americans – 38 per cent each way – say they’ve seen the economy improve and worsen under Barack Obama. A slightly smaller number (34%) anticipate a worsening under Trump, while a higher number (43%) expect conditions to improve. Americans voice negativity about their nation’s standing in the world after two terms of President Obama. Just one-quarter (25%) say the US has enhanced its place in the world in this time, while close to half (45%) say it has diminished. Opinion is similarly negative on how a Trump presidency will affect the balance of peace around the globe, and the security that Americans and their closest allies feel from the threat of terrorism. Barack Obama took the reins to the United States government as the 44th president in January of 2009 with one pressing issue on the minds of all Americans – the economy. The global economic crisis of 2008 had hit America with a crushing impact, reducing real GDP growth to a negative integer for the first time since 1991 (-0.3% 2008, -2.8% 2009), and resulting in an unemployment rate spike not seen since the 1980s. For these reasons, the first large scale move the government made was passing an $800 billion bill – the American Recovery and Reinvestment Act – a combination of infrastructure spending and tax cuts designed to stimulate an economy in disrepair. And while this, along with signing the Dodd-Frank Wall Street Reform and Consumer Protection Act will be remembered as the major centrepieces of Obama’s economic policy, whether they have had the desired effect is the subject of much debate years later. Americans, for their part, are split on whether the Obama years have improved or worsened the state of the U.S. economy. Four-in-ten (38%) take each side of the debate, with the resultant group, 24 per cent, saying things are essentially the same. Still, concerns persist over the levels of inequality between middle-class workers and the top 1 per cent, and massive government debts are a problem that the next administration will inherit. Americans are much more negative when asked to consider how their nation’s standing in the world has changed over the past eight years. Almost half (45%) say that the US is in a worse place now than when Obama took office, while just one-in-four (25%) say the nation is stronger, geopolitically. Much of this opinion may owe to how Americans perceive US power is being projected to other parts of the world. Two specific events from the past eight years, the annexation of Crimea by Russia, and the so-called “red line” in Syria are viewed as weak points by critics of the administration’s foreign policy. This, added to an unpopular nuclear deal with Iran, and recent allegations that Russia hacked the U.S. election to influence results in its favour, have likely contributed to negative perceptions of where the United States stands in the world order. It is worth noting, however, that although Americans appear sullen about their nation’s standing, public opinion among many other nations when looking at the US has improved over Obama’s two terms. While the later years of George W. Bush saw a lag in opinion polling, due in large part to the war in Iraq, these numbers tended to trend upward among key US allies. U.S. residents are most negative in their assessment of how their country and its closest allies are now positioned against the threat of terrorism. Recent, high-profile attacks in France, Belgium, Turkey, and many other nations have created a sense of unease among many in the West. And the US itself has seen ISIS-inspired violence in Orlando and San Bernadino. This may help to explain why Americans are more than twice as likely to say that the threat of terrorism has worsened (49%) than improved (19%) over the Obama presidency. While the civil war in Syria and conflicts across the Middle East and parts of Africa endure, the threat of terrorism remains real in all parts of the world. 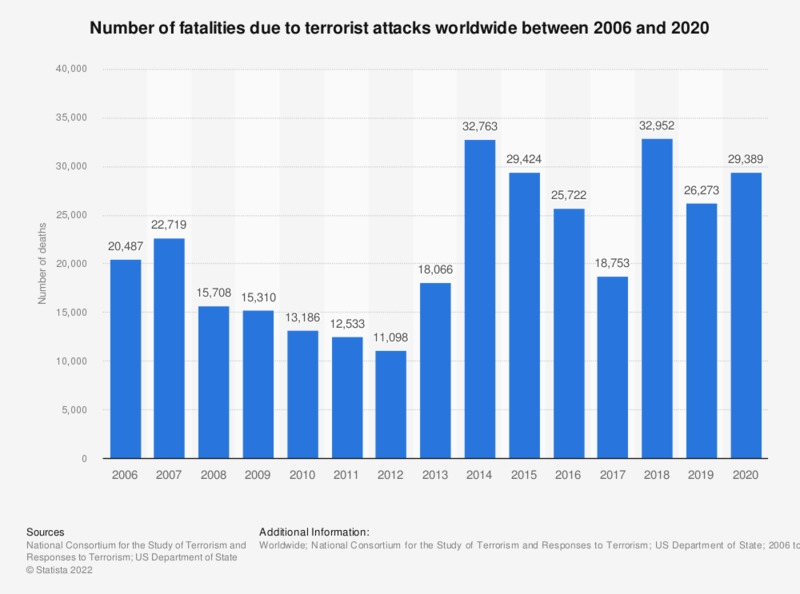 The total number of fatalities from terrorist attacks across the globe dropped in each of President Obama’s first four years, however, this trend reversed and rose rapidly from 2013 to 2015. Wars, sanctions, free trade deals, aid – the policies administered by the American government touch millions of people outside its borders. For this reason, the Angus Reid Institute asked Americans to evaluate their outgoing president on his reach and impact on a global scale. On each of the two questions asked – how the eight years under Obama have affected the lives of ordinary people around the world, and how his administration has affected global peace – Americans voice discontent. About one-in-three say the situation hasn’t changed much, though the largest number on each measure say the globe is worse-off now. Some of the events that may have influenced opinion on this matter – for example, the refugee crisis and war in Syria – are the subject of much controversy as to what the administration could or should have done. That said, many major challenges, from ISIS to global warming, remain, and Americans appear wary of the state of the globe heading into the Trump years. It bodes well for Trump that his message on the economy has resonated strongly enough to garner a plurality of optimism, as he doesn’t on any other question. That said, this optimism breaks down roughly along party lines. Just over one-in-ten (13%) Hillary Clinton supporters say they expect an economic improvement, while six-in-ten (59%) say Trump is going to have a negative effect. These partisan splits define each of the five questions asked. For Trump supporters, this is the dawn of a new era, and a time of unbridled optimism. For Clintonites, there simply isn’t much positivity to be found. This sentiment is perhaps best summed up by one simple question. Americans were asked whether they are optimistic and hopeful for the Trump administration or pessimistic and worried. Perhaps unsurprisingly, those who supported Trump in the election are near-unanimously positive (94%) while Clinton supporters enter the new term with just one-in-five (18%) voicing hope.